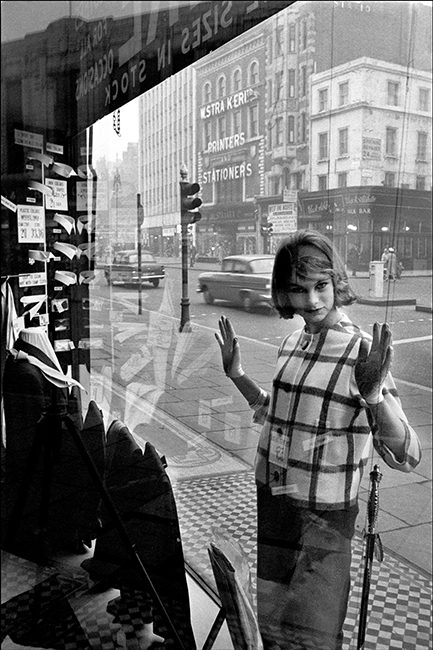 Duffy took this photo of Jean Shrimpton on the Edgware Road, London. Shot for Vogue in early 1961, Shrimpton peers through the window of a suit hire shop. The image was taken opposite the former Woolworths department store. The location was identified from a reflection in the shop window on an alternative image from the shoot. The road in the background leads to Crawford Place W2 which is almost unrecognizable in comparison today. Jean Shrimpton was arguably the face of the Swinging Sixties. Duffy met Shrimpton on a shoot he was doing to Kellog’s Cornflakes. He continued to work with Shrimpton throughout his career from the sixties through to his work with Biba in 1973. Quote ref: E_456_05 if you require press information regarding this image.